Okay folks – the wind is blowing, the sky is ominous and it definitely feels like something is coming! 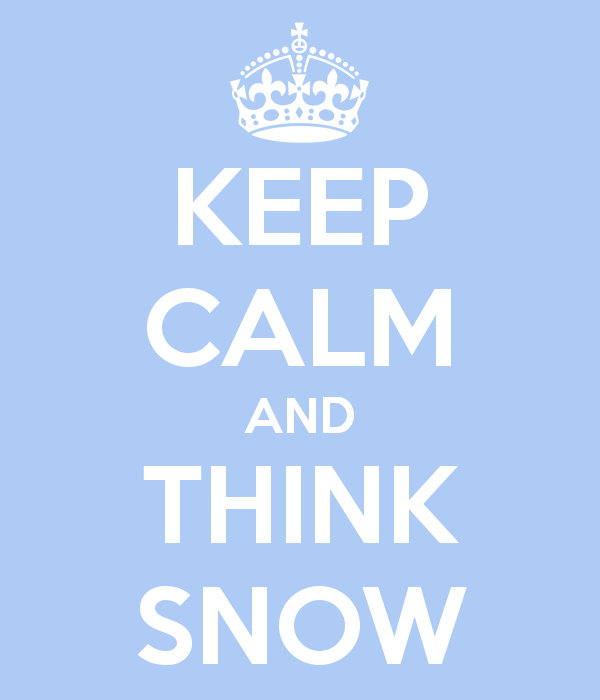 We all have our fingers crossed for some much-needed snow to blanket Big Bear Lake over the next few days. 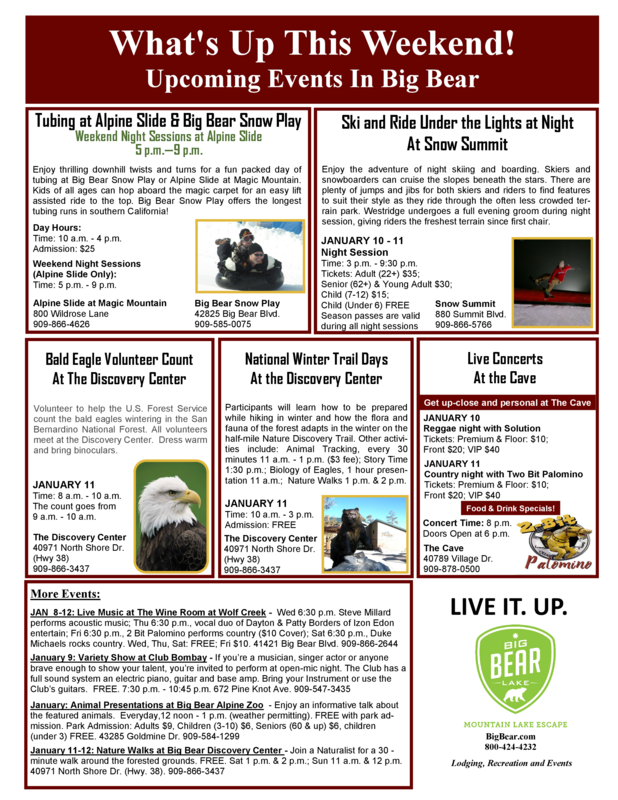 There are several fun events happening this weekend and there is always plenty to do in Big Bear – with or without snow! Don’t forget that Presidents Day Weekend is right around the corner so be sure to visit our website to book the perfect cabin for your mountain getaway. We have several new cabins available including homes with spas and a cabin with an absolutely fantastic game room! Book your Big Bear Cabin today!! You enter on the first floor of Mountain Hideaway. Here you will find 3 Bedrooms and 2 Full Bathrooms. The Master Bedroom features a comfortable Queen Bed, Flat Screen TV w/ Cable and Blu-Ray Player, and a slider to your own private Deck that leads to the treed backyard. The attached, private Bathroom has dual sinks and a tub/shower combo. Guest Bedroom 1 also has a Queen Bed, Flat Screen TV w/ Cable and Blu-Ray, and has access to a shared Full Bathroom. In Guest Bedroom 2 you will find Twin Bunk Beds and a separate Twin Bed as well. This room also has access to the shared Bathroom. Venture upstairs to the main Living Area and you will find the perfect place to relax, gather and have fun. The second floor boasts vaulted ceilings and plenty of windows with beautiful views, along with more lovely, mountain decor. To your left you will find a cozy Living Room area with a comfy sofa & loveseat, Wood Burning Fireplace, and Flat Screen TV w/ Cable, Blu-Ray & WiFi. When you are ready to “unplug”, there is also a table and chairs to enjoy the large selection of board games. Straight back is a door to the spacious Deck. Barbeque, enjoy the fresh mountain air, or admire the spectacular views – including great views of Bear Mountain Ski Resort. There is also access down to the back yard; a lovely, serene space – the perfect place to see some wildlife and get in touch with nature! Mountain Hideaway is a truly wonderful ‘home away from home’ for your family and friends and it really does have it all – For Entertainment: Pool Table, Air Hockey Table, Foosball Table, Board Games/Table and TV’s with Cable & Blu-Ray. For Relaxation, Lovely views from all windows, Spacious Deck with Ski Resort views and a ‘woodsy’ Back Yard to enjoy the forest. All this plus you are only a few minutes from everything Big Bear has to offer. View more photos, check availability and book Mountain Hideaway online at RSVacations.net today and treat yourself to a relaxing Big Bear Lake Vacation. Headed into the long MLK weekend here in Big Bear Lake, we still have beautiful, spring-like weather. The Ski Resorts and Snow Play areas are open, the roads are clear, so come on up to the gorgeous blue skies and fresh air! Here at RS Vacations we have some great, last-minute deals on cabins for this coming weekend and beyond. Check out our super selection of Big Bear cabins at RSVacations.net. While you’re there, be sure to take a look at our specials page for deals and packages! We are still waiting for Old Man Winter to arrive. Maybe his flight was delayed on the East Coast. 😉 Even though the snow has been light this season (so far), the Ski Resorts and Snow Play areas have been making snow every chance they get and have pretty good coverage for your wintertime fun and there is always something to do in The Village. Following is a list of some of the upcoming special events happening around the valley. When you find something that sounds fun, visit our website at RSVacations.net and book a Big Bear Cabin for your perfect Big Bear Escape! Join the Southern California Mountains Foundation and the Big Bear Solar Observatory on Thursday, January 16, 2014 at 4:00pm to welcome guest speaker, Jay Pasachoff, a leading scientist on solar eclipses, in a stunning presentation of “The Sun and Solar Eclipses”. Night League Race Series: Open to the public these races take place under the lights! With age, gender, ski, and snowboard classes available you can compete against your discipline in these fun night dual style races. Call for more details. Night Sessions at Snow Summit. Please call or visit website for rates and more details. Friday Nights through March 7, 2014. Saturday Nights through March 8, 2014. Big Bear’s Alpine Slide offers Evening Sessions every Friday and Saturday Night through March. Tickets are $20 per person. Please call or visit website for more details. Singers, comedians, bands, and acts of all kinds will have the opportunity to showcase their talent at this major venue. Winning acts will be picked by the audience and a panel of judges. Come one, come all, if you have what it takes! Tickets are only $7.00 at the door!! Please include the name of your act and genre, videos and links to your sound, telephone number and email address. Stand-up comedian Andrew Dice Clay, known as the “Undisputed Heavy Weight King of Comedy,” makes a rare appearance at The Cave on Friday, January 24 and Saturday, January 25, 2014. Clay will perform his bad-boy style of comedy that made him legendary, including his infamous nursery rhymes. Special guest Eleanor Kerrigan is the opening act and Andrew Dice Clay’s sons Dylan and Max close the show with their rock band LA Rocks. The show starts at 8 p.m. each night. Ticket prices for general theatre seating range from $60 to $125. VIP pit table tickets that include cocktail/bottle service are $500. VIP box ticket packages are also available for parties of 12 or more. The show contains graphic language, adult satire and strong sexual content. Anyone 17 and under requires adult supervision. There are no refunds given based on show content. Tickets are non-transferable and non-refundable. To purchase tickets in advance log onto www.thecavebigbear.com or call 909-878-0204. Advance tickets and/or lodging packages are also available at www.bigbear.com or call 800-424-4232. 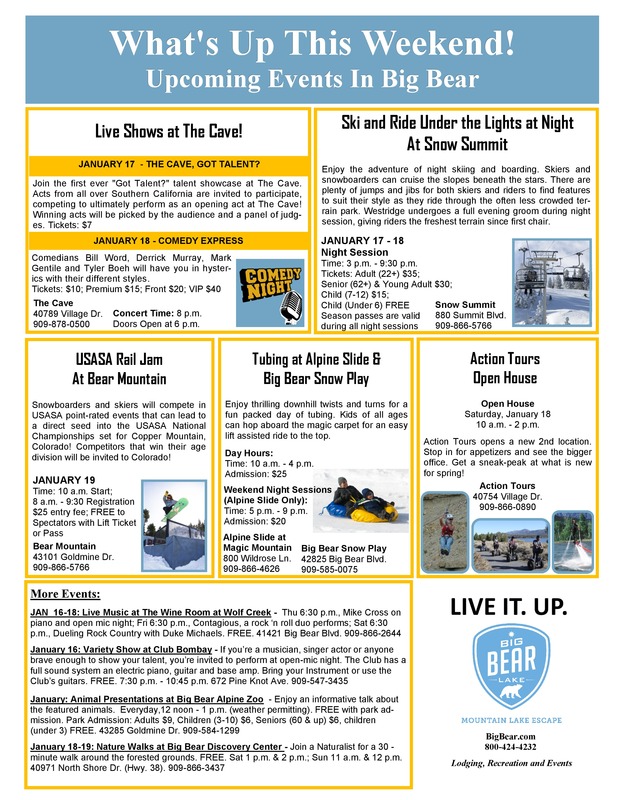 A USASA Snowboarding event at Bear Mountain. USASA is a solid grassroots organization that allows men and women, boys and girls of all ages and abilities to participate in organized snowboarding. Please visit their website at www.usasa.org. The Peanut Butter and Rail Jam is Volcom’s amateur snowboard contest series. The goal of the series is to give something back to the kids. Deviating from the established way snowboard contests are run, we put our heads together and came up with a fresh format. The event is absolutely free, on a first come first serve basis, and boasts tons of free prizes and PB&J sandwiches! Also, everyone who enters walks away with a t-shirt and stickers!! See you on the hill! Please call or visit website(s) for more details. Two Day Women’s Ski and Snowboard Clinics at Bear Mountain and Snow Summit. Two Sessions: February 1-2 and March 1-2. Please visit www.womensedventures.com for more details. Please note that reservations must be made one full week in advance. A giant slalom ski race at Snow Summit for USSA members. Please visit www.snowsummitraceteam.org for details. Join Forest Service Biologist for a 1-hour presentation on the biology of eagles and why they winter in the Big Bear Valley; great for families to learn together about our National Bird! December 27; January 11; February 8; March 8 11am-12pm Free to the Public. Donations appreciated! The Arts Council of Big Bear Valley presents “Youth Orchestras Unite” a special collaboration between the Pasadena Youth String Orchestra and Wind Ensemble and the All Mountain String Ensemble conducted by Sharon Rizzo. The performance is FREE to all. The Pasadena Youth Symphony Orchestra has continually offered robust musical training and personal development for young musicians throughout the San Gabriel Valley for over 40 years. The PYSO String Orchestra is a separate and integral division of the Pasadena Youth Symphony Orchestra. This all-string ensemble, led by conductor Pin Chen, has steadily developed into a prestigious and important asset to PYSO. The String Orchestra provides a unique musical opportunity for string players, grades 6-9, to experience vital musical growth and perform orchestral arrangements within a string ensemble. The PYSO Wind Ensemble made its debut in 2007. Under the direction of long time conductor and music educator Gary Yearick, this ensemble includes woodwind, brass, and percussion players in grades 6-9 and provides a much-needed venue for wind players and percussionists to sharpen their skills. The Wind Ensemble will occasionally partner with the String Orchestra in performance, giving all musicians the opportunity to perform within a full symphony orchestra setting. The All Mountain String Ensemble is a combination of the top students in the Big Bear Lighthouse Youth Orchestras and the Arrowhead Arts Youth String Ensembles in the mountains of Southern California. These programs have been solely developed through the tenacity and intense desire of their director, Sharon Rizzo. The students, grades 6-10, compete individually, as well as collectively, on their instruments and have become regionally recognized, winning top honors at music festivals and competitions. They enjoy performing a variety of genres in many unique venues, on and off the mountain. For more information please call or visit website. A Ski and Snowboard event at Bear Mountain. Please call or visit website(s) for more details. Saturday Night: Monster After Party at AV bar. If weather is bad on Saturday we will proceed with Saturday’s Schedule on Sunday. If not we will enjoy fun in the sun and athlete participants are welcome to ride the course. Special Olympics Southern California is excited to announce the 3rd Annual “Polar Plunge.” Run, walk, or dance into the chilly waters of Big Bear Lake on Saturday, March 8 to raise funds for Special Olympics Inland Empire. For just a minimum of $50, you can participate in the coolest event of 2014 — the Polar Plunge. Not only will you brave the cold waters, but you’ll have the opportunity to earn incentives, party with friends, and support Special Olympics. The Polar Plunge is an event where all participants race into the frigid waters of Big Bear Lake. Plungers decide how deep they’ll go and how long they stay in the water. Some Plungers only get their ankles wet while others stay in until the lifeguards make them leave the water! The goal of the 3rd Big Bear Polar Plunge is to raise a minimum of $50,000. Your support of this event will help Special Olympics Southern California reach out and provide year-round training and sports programs for children and adults with intellectual disabilities in the Inland Empire Region. KROQ Storms Bear Mountain – Get there early because it’s gonna be crowded! Enjoy free music from some pretty awesome bands, ride til you can’t stand anymore, and maybe throw back a few drinks at the bar. It’s going to be a blast! 18th Annual Victor Alvarez Memorial Race and Silent Auction- Pro-Style Giant Slalom. Registration 8:00-9:30am in the middle level at Bear Bottom Lodge. 16 &up $70 to enter, 15 & under $50. Qualifications 10am, elimination 1pm. $3,075 cash purse. Silent Action with tons of prizes to be announced. For more information contact Erin Riddle at (909) 585-5246. Enjoy farm fresh fruits, vegetables and flowers all summer long. The Farmer’s Market also features unique arts, crafts and handmade items by local artisans. Every Tuesday from April 1st until September 23rd. For more information please visit website. 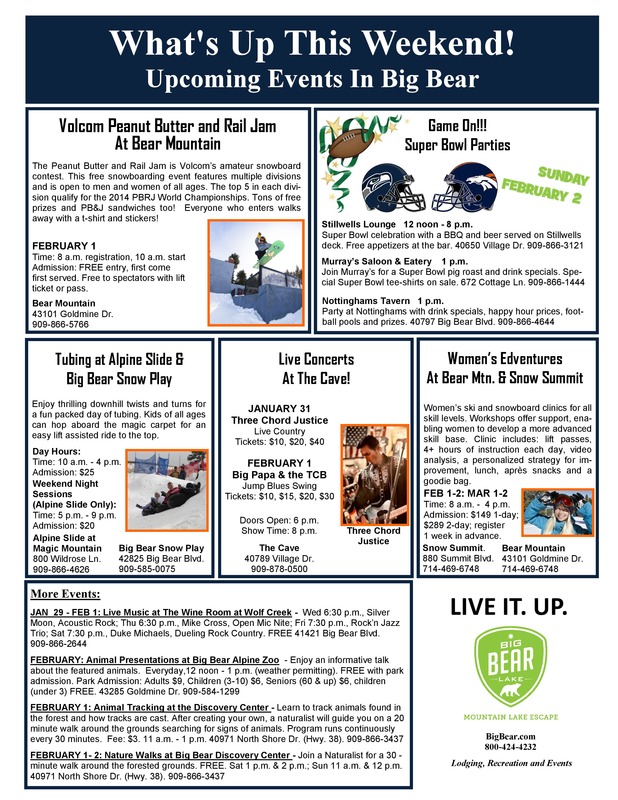 Enjoy everything Big Bear has to offer and be mere minutes from the action at Southern Comfort. This cute, 3 Bedroom, 2 Bath single story cabin is located in Moonridge, less than 2 minutes to Bear Mountain Ski Resort, The Big Bear Alpine Zoo and the Golf Course. There is level parking for 3 cars. The cabin has easy access and only one step-up which makes it perfect for seniors or multi- generation family stays. Southern Comfort welcomes you with a large covered porch that features a cozy swing for 2. Step inside and kick off your boots in the woodsy living room and unwind in front of a crackling fire in the brick fireplace. Enjoy your favorite entertainment on the Flat Screen TV with cable, WiFi and Smart Blu-Ray Player. If you want to “un-plug”, there is a nice variety of board games to enjoy or get competitive with a friendly game of Foosball. The updated, well-equipped kitchen features granite tile counters, beautiful wood cabinets and newer appliances (range, microwave, refrigerator and dishwasher). The dining table is the perfect spot to enjoy your coffee and a home-cooked meal. The back door leads to a fenced area for the kids to play and a great snow-play hill for hours of winter fun! The master bedroom boasts a brand new queen mattress and a comfy chair for catching up on your favorite novel. This room also has a private, full bathroom. Guest room 1 also has a queen bed and guest room 2 is the place for kids with twin bunks and a Futon to sit on. There is a TV here as well that you can hook up your gaming system or movie player to. Full Bathroom 2 is conveniently located near both guest rooms and a full size washer and dryer is provided for your convenience. With a great, Moonridge location, private sledding hill and room for the family, Southern Comfort is just the place to ‘get away from it all’ any time of year. Book today!! View more photos, check availability and book Southern Comfort online at RSVacations.net today and treat yourself to a relaxing Big Bear Lake Vacation. The mild weather continues here in Big Bear Lake and even though we definitely want the snow to come, it is absolutely gorgeous up here! So until Mother Nature decides to cooperate, the snow guns are pumping out the white stuff every chance they get and we all get to enjoy the sparkling blue skies and spring-like temperatures. Want to enjoy Big Bear under the stars? Snow Summit offers Night Session every Friday and Saturday night until 9:30 PM and Snow Play at Alpine Slide has night tubing for your enjoyment. Weekends offer some great music and entertainment choices in the Big Bear Lake Village where you can sip your hot chocolate by one of the new outdoor fire pits. 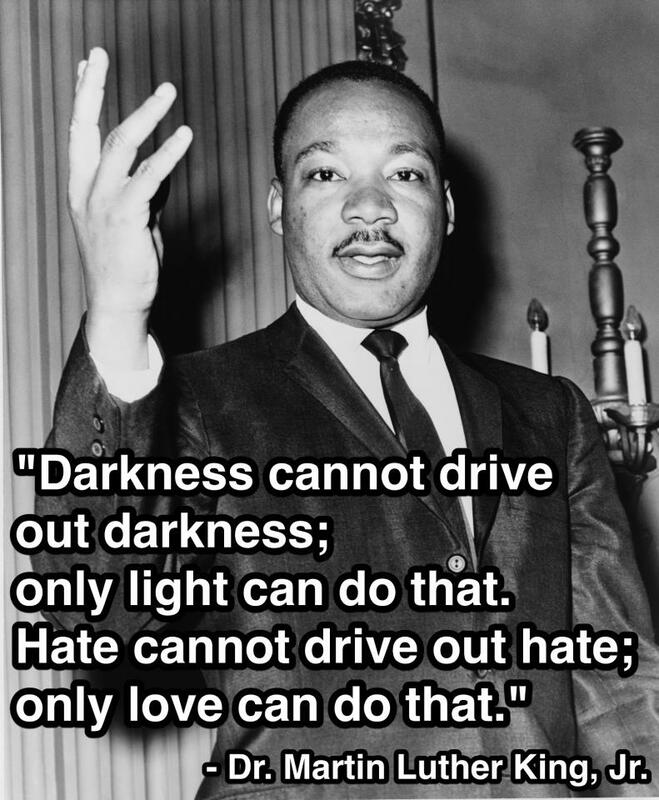 RS Vacations is offering a great deal on cabins for Martin Luther King Weekend. 3 nights for the price of 2 for your 3 or more night stay January 16-21, 2014. Also, check out our discounted ski packages for non-holiday periods. Save 15% – 25% on your cabin AND your lift tickets. If you choose the mid-week package, kids ski FREE with purchased adult ticket. Check out details and restrictions on both of these specials here. Enjoy everything Big Bear has to offer and be mere minutes from the action at Moondrift. This cute, 2 Bedroom, 1 Bath cabin is located in Moonridge, only 3 minutes to Bear Mountain Ski Resort, the Big Bear Alpine Zoo and the Golf Course and less than 10 minutes to the Village. There is level parking for 2 cars. As you enter Moondrift, you will instantly feel that “homey” feeling and know you are in the right place to make some lasting, family memories. You will love the classic woodsy interior and cute mountain decor throughout this cabin. The Living Room features a cozy, brick fireplace and a comfortable sectional (with a recliner and Queen sleep sofa) that has room for everyone. Kick back after a day on the slopes, lake or on the golf course in front of the Flat Screen TV and enjoy the DVD, HD Cable and WiFi. Feeling competitive? Check out the huge selection of board games in the coffee table! The updated Kitchen has granite counters and a new range, microwave and refrigerator (there is no dishwasher) along with everything you’ll need for enjoying meals at home. The bar seats 2 while the adjacent dining area with ceiling fan seats 4. In the Master Bedroom you will find a comfy, King Bed and a Flat Screen TV w/ DVD. Nearby is the cabin’s adorable bathroom that has a shower (no tub) and there is a full size Washer & Dryer in this home for your convenience. Bedroom 2 features a Queen Bed along with a Twin over Full Bunk Bed. There is a Flat Screen TV w/DVD in this room as well. Off of the Dining Room, you will find a door that leads out to a spacious Deck where you can Barbeque or just relax and take in the fresh, mountain air. Just down the steps is a new Spa – the perfect end to a perfect day! Moondrift can be your family’s home away from home in beautiful, Big Bear Lake. It has a fabulous, central location, easy access and that classic, cabin feel. You won’t be disappointed! Book today!! View more photos, check availability and book Moondrift online at RSVacations.net today and treat yourself to a relaxing Big Bear Lake Vacation.